Photo of woman getting a mammogram by BSIP/UIG via Getty Images. It’s an assertion the American College of Radiology and other prominent groups call “flawed and misleading,” adding that it could confuse women who should be receiving the test and cost lives. On Tuesday evening’s PBS NewsHour broadcast, health correspondent Betty Ann Bowser explores this latest firestorm in the oncology community and what ordinary women should take away from all of the conflicting information. In the meantime, we’ve asked three of the nation’s most influential doctors whether women over the age of 40 should be screened yearly. Below, Dr. Sandra Swain of the American Society of Clinical Oncology says yes. Dr. Archie Bleyer, co-author of the New England Journal of Medicine report says no. And Dr. Barnett Kramer, director of the National Cancer Institute’s Division of Cancer Prevention, explains the scientific basis for both arguments. Dr. Sandra M. Swain is president of the American Society of Clinical Oncology, the world’s leading professional organization representing physicians who care for people with cancer. Dr. Swain, a breast cancer specialist, is also medical director of the Washington Cancer Institute at MedStar Washington Hospital Center. We now know much more about breast cancer than we did even a few years ago. Scientists have begun to be able to differentiate types of breast cancer based on molecular anatomy. As a result, we know that breast cancer actually is a term used to describe several separate types of diseases — an understanding that allows us to increasingly personalize treatment based on sub-type. We have also had a tremendous advance in the systemic therapy for breast cancer, including hormonal therapies such as Tamoxifen and Aromatase inhibitors, and also chemotherapy. The other major factor that has decreased the breast cancer mortality is screening mammography, which uses low-energy X-rays to examine the human breast and is used as a diagnostic and screening tool. The test is especially useful in women over 50, where the mortality reduction is 20-30 percent. In women from 40-50, the reduction in breast cancer mortality is at least 15 percent. Like any medical test, however, mammography involves risks, such as additional invasive testing and anxiety if the test falsely shows a possible tumor; this is called a false-positive. Occasionally — up to 10 to 15 percent of the time — mammography may miss a cancer, which is called a false-negative. The U.S. Preventive Services Task Force (USPSTF) recommends that women ages 50 to 74 have mammography every two years. They recommend that mammography be considered in women ages 40 to 49 after evaluating the risks and benefits of this test with a physician. The American Cancer Society (ACS) recommends yearly mammography beginning at age 40. Recent studies have raised questions about the optimum frequency of mammography: Should women have mammograms once a year? Once every two years? 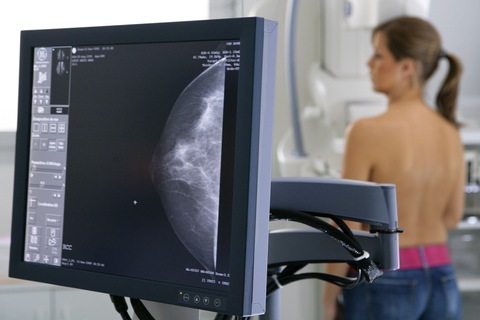 At what age should women begin to have regular mammograms? These studies are important, because they help us to gain a better understanding of the risks and benefits to mammography screening over time. That said, we need to be careful not to let negative or conflicting studies create upset and negativity around mammography as a whole. Until we have better tools to identify individuals who are most likely to benefit from screening, mammography remains the best available tool for detecting breast cancer in the general population. Our hope is that these studies do not shake women’s confidence in the benefits of mammography. Under the present guidelines, less than two-thirds of women who are recommended for screening are currently getting annual mammograms. Our biggest challenge is getting women screened … period. The abysmal screening rates are a much bigger issue than that of age and/or frequency of mammograms. I would recommend that women receive an annual mammogram. If you have some of the more deadly breast cancers that are growing faster, you would be missing something if you did not receive this yearly test. When you diagnose a breast cancer at an earlier stage, you are able to give the patient less treatment with less surgery, potentially less chemotherapy and less women may need less surgery or systemic therapy such as chemotherapy. So this is really a great benefit for patients to have an earlier diagnosis. African-American women have a lower incidence of breast cancer diagnosis, but a much higher rate of death from breast cancer, and unfortunately many African-American women are not getting screening mammography according to guidelines. The bottom line is that all women should talk with their doctors about mammography and decide on an appropriate screening schedule. For women with a high risk of breast cancer, screening may be recommended at an earlier age or more often than the schedules listed above. Some will say, “I’m happy with the risk of getting breast cancer; I’m not happy with having to have all these tests,” so they will decide not to get a yearly mammogram. Others will say, “I want to do everything possible to diagnose this, even if it’s overtreatment.” It really depends on the makeup and the personality of the patient. Only your doctor can help you estimate your individual risk for developing breast cancer and determine what level of screening is best for you. For more information about breast and other cancers, I also encourage you to visit www.cancer.net. Dr. Archie Bleyer, co-author or a recent New England Journal of Medicine report showing mass over-diagnosis of breast cancer, describes why he believes yearly mammograms can cause more harm than good. Dr. Barnett Kramer, director of the National Cancer Institute’s Division of Cancer Prevention, explains the costs and benefits of mammography that he says every women should consider before making her own decision.